To access Store Transfers from the menu bar of the main TeleTracker Online screen, click Transactions, then Store Transfers. Select the appropriate Store Transfer Transaction type (Store Transfer IN, Store Transfer OUT or Request Store Transfer). To open an existing Store Transfer, select the Transaction from the Store Transfer list and click the Open button. icon on the TeleTracker Online toolbar. Select the appropriate Store Transfer Transaction Type (Store Transfer IN, Store Transfer OUT or Request Store Transfer). IMPORTANT: When creating an Outbound Store Transfer, you must be logged into the location that the product(s) will be transferred OUT of !!! 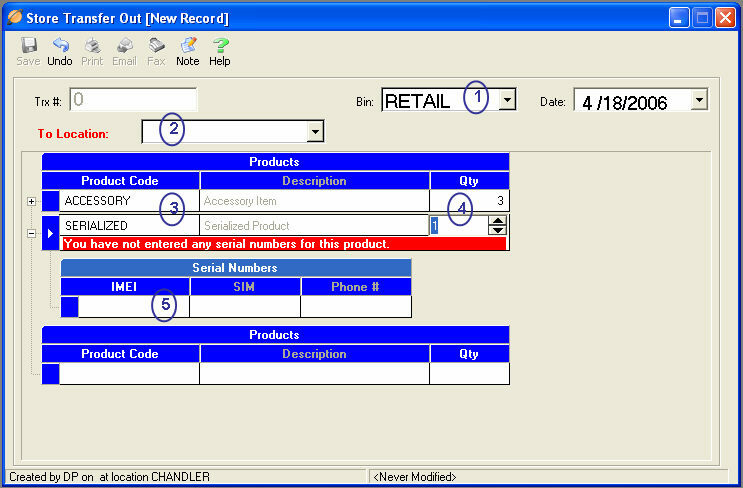 All items marked in RED are required fields and must be populated before the Store Transfer can be saved. (1) Select the appropriate Bin for which you will transfer the product(s) OUT. (2) Choose the Location the product(s) will be transferred to. Click the To Location drop-down list and select the desired Location. (3) Enter the Product Code of the product you wish to transfer. Enter the Product’s code by scanning the item with a barcode scanner, typing the Product code into the product code field, or by performing a lookup and choosing from existing Products. To perform a lookup and choose from existing products, click on the lookup button within the Product Code field. Highlight your choice and double-click or click the Enter key. TeleTracker Online will automatically populate the product’s corresponding information as defined in the Product Master File. (4) Enter the Qty (Quantity) of the product being transferred OUT of inventory. You may change the quantity by either using the scrollbar on the right-hand side of the Qty field or by manually entering the desired quantity. You can determine how many products are available to transfer by holding your mouse stationary over the Qty field. As a result, a yellow box will appear reflecting the quantity of the respective product can be transferred from the Bin you have selected in the Bin drop-down list. (5) When transferring serialized products, a sub-menu will appear prompting you to enter the product’s serial numbers. You may enter serial numbers either by scanning them with a barcode scanner or by manually entering the values. You may also select serial numbers by clicking the drop-down list located in the Serial Number field. Select the appropriate serial number you wish to transfer out. The Store Transfer cannot be saved without entering valid serial numbers for each serialized product. To Store Transfer Out additional products, proceed to the next product code line and repeat the steps above. You may enter notes within the Purchase Order by clicking the Note button located on the toolbar. A dialog box will appear allowing you to enter notes. To time-stamp a note entry, simply click the Log Entry button and TeleTracker Online will automatically populate the date and time of the entry, as well as the user entering the notes. Click the OK button when finished. Depending on the Security Levels chosen for Store Transfers and Salespeople, you may be prompted with the option: 'Would you like to automatically receive this merchandise into location ...'. If you select Yes, TeleTracker Online will save the Store Transfer and automatically place the inventory into the To Location specified in (2) . You will then be prompted to select a Bin to place the inventory in. Selecting No will require the receiving location to accept the store transfer by creating a new Store Transfer IN.